Cochabamaba 2000. Credit: thehealthculture.com In April 2000, a popular struggle against water privatization in Cochabamba, Bolivia’s third largest city, ignited a chain of events that profoundly altered the nation’s political landscape. The Water War was precipitated when SEMAPA, Cochabamba’s municipal water company, was sold to a transnational consortium controlled by U.S.-based Bechtel in exchange for debt relief for the Bolivian government and new World Bank loans to expand the water system. A new law allowed Bechtel to administer water resources that SEMAPA did not even control, including the communal water systems prevalent in the ever-expanding southern periphery and in the countryside, which had never been hooked into the grid. Local farmer-irrigators feared that “even the rain” collected and distributed for centuries by their associations would fall within Bechtel’s grasp. These concerns, along with a 50% average increase in water rates for SEMAPA customers, prompted the formation of a broad alliance of farmers, factory workers, rural and urban water committees, neighborhood organizations, students, and middleclass professionals in opposition to water privatization. They were joined by the militant federation of coca growers from the Chapare, led by then labor leader Evo Morales, who lent his considerable expertise in organizing civic strikes, road blockades, and massive popular assemblies. Eventually, Bechtel was forced to abrogate its contract, return SEMAPA to public control, and withdraw its legal claim against the Bolivian government for $50 million in compensation. 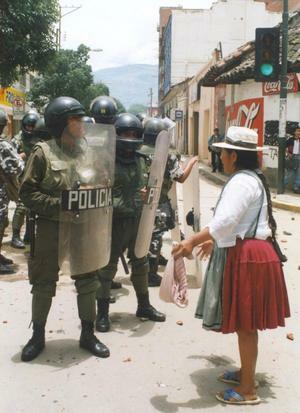 This iconic struggle crystallized a growing demand for popular control of Bolivia’s natural resources, leading to the Gas Wars of 2003 and 2005, the overthrow of two neoliberal presidents, and the subsequent election of Evo Morales and the MAS (Movement Towards Socialism) party as a “government of the social movements.” A second water revolt—this time by neighborhood organizations in the sprawling indigenous city of El Alto—ousted the French multinational Suez company from the recently-privatized La Paz-El Alto water district. 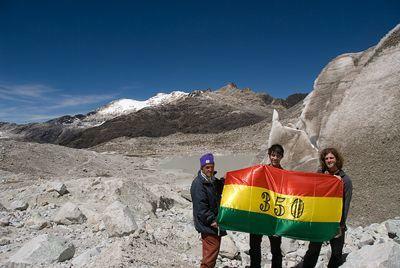 Bolivia’s new constitution, enacted in 2009, proclaims that access to water is a human right and bans its privatization. 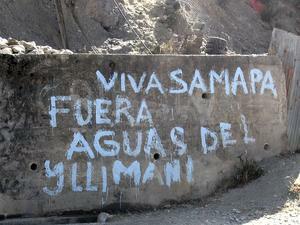 Outside Bolivia, the Water War helped to inspire a worldwide anti-globalization movement and provided a model for water-justice struggles throughout the Americas and beyond. The Bolivian government led the successful drive for UN recognition of water and sanitation as a human right in 2010 and is in the forefront of a new international campaign for a UN declaration against water privatization. On the domestic front, as water-justice advocates look to Bolivia for successful alternative models to privatization, the implementation of these hard-won water rights has proved to be a significant challenge. The Morales government has sought to develop a new institutional framework that positions the state as a direct protagonist in providing and regulating water and sanitation services. The Water Ministry, created in 2006 to integrate the functions of water supply and sanitation, water resource management, and environmental protection, is the first of its kind in Latin America. It has a mandate to end water privatization, including the creation of a public water company to replace the temporary utility established for La Paz-El Alto after the exit of Suez. 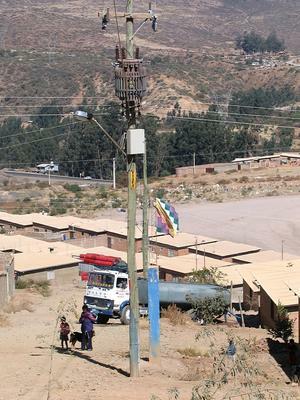 Almost six years after the final ouster of Suez, the Water Ministry is still negotiating the design of the La Paz–El Alto public water company, with divergent visions held by combative El Alto neighborhood groups, the City of La Paz, and the Morales government. La Paz has periodically threatened to withdraw and establish its own municipal water utility. While the Water Ministry has taken over the functions of the formerly privatized water regulatory system, controlling and monitoring the activities of Bolivia’s approximately 28,000 local water and sanitation providers has proved to be a challenge. The sector encompasses a diverse range of organizations, from sophisticated utilities like SAGUAPAC in Santa Cruz—the largest urban water cooperative in the world—to thousands of independent water committees in rural and peripheral areas, who manage artisanal wells and antiquated distribution systems based on traditional uses and customs. These small providers are burdened with poorly constructed and deteriorated systems, operating deficiencies, and community conflicts. An estimated 35% of their water is lost to leaks and clandestine hook-ups. While only a fraction of independent providers are even registered with the government, efforts to curb their traditional rights can become an explosive political issue—as evidenced by the Cochabamba Water War. In the absence of a comprehensive regulatory framework, tensions between these traditional methods of water provision and the new system of formal water rights are far from being resolved. Still, the Morales government has made significant efforts to strengthen the capacity of independent water providers through technical assistance and financing, recognizing their role as a critical partner in the government’s water development agenda. Twelve years after the Water War, the challenge of developing alternative models to privatization is readily apparent in Cochabamba. While the re-municipalized SEMAPA has more than tripled the size of its service area since 2000, at least 40% of the city’s residents—mostly in the southern hillside districts, which were the chief protagonists of the Water War—still lack piped water and sanitation services. Those remaining outside the grid are forced to pay five to 10 times more than SEMAPA consumers for trucked-in water of dubious quality. Even on the grid, water service is intermittent. Water truck, Cochabamba. Credit: Ben AchtenbergAlthough the reconstituted SEMAPA includes elected community representatives on its board of directors, problems of mismanagement, corruption, and inefficiency continue to plague the organization. In 2010, the company was forced to lay off 150 workers to overcome a $3 million cash deficit, due to alleged irregularities such as payroll padding, materials thefts, and continued diversion of the system’s water. Frustrated with both the private and public water management models, residents of Cochabamba’s southern zones are increasingly relying on traditional community-run water systems as an alternative. Many of these neighborhoods have established autonomous and participatory water distribution systems managed by elected water committees, cooperatives, or community councils that are seeking to collaborate to varying degrees with SEMAPA. The local water committees have affiliated through ASICA-Sur (the Association of Community Water Systems of the South) to receive technical assistance and, in some cases, direct EU financing for their systems. They hope to buy water at bulk rates from SEMAPA while remaining under community control. The model of decentralized social-public water management may prove to be more viable than either the private or the state-centric model for countries like Bolivia, with major geographic barriers to centralized service provision, a weak state sector, and a strong culture of community participation. Still, regardless of the management model, the major challenge facing Bolivia’s water sector today is the need for significant resources to upgrade and expand the existing infrastructure and develop new water sources. While the Morales government has made significant progress in this area, a great deal remains to be accomplished. Recently, the government announced that Bolivia will meet its overall Millennium Development Goal for access to safe drinking water three years ahead of schedule, with 88% overall coverage achieved in 2010. But potable water access rates in Bolivia’s rural and peri-urban zones (71%) lag far behind those for urban areas (96%), and are among the lowest in Latin America. And only 27% of Bolivians have adequate sanitation facilities—the second-worst record in the region, after Haiti. The national development plan calls for a $700 million investment between 2010 and 2015 to upgrade Bolivia’s water and sanitation infrastructure, including climate change adaptations. Like its neoliberal predecessors, the Morales government continues to rely on foreign donors (principally the Inter-American Development Bank, the Venezuela-dominated Latin American Development Bank, Spain, Italy, and Japan) for as much as 80% of this funding. Most of the balance is expected to come from the departmental and municipal governments, whose revenues—derived principally from hydrocarbons royalties—have increased substantially under Morales. Water researcher Susan Spronk points out that only 1.5% of the national budget (from direct Treasury revenues) is dedicated to water and sanitation improvements, while 80% is allocated to mining, hydrocarbons, hydroelectricity, and transportation infrastructure. The reliance on foreign investment reinforces the concept of a “climate debt” owed by industrialized countries to developing nations, which Morales has justifiably promoted. Still, it keeps Bolivia’s rate of water and sanitation infrastructure expansion dependent on external priorities, introducing a level of risk and unpredictability that could be problematic in the context of today’s worldwide financial crisis. Critics argue that the Morales government’s budget priorities reflect its continued commitment to a “neo-extractivist” development model, at the expense of meeting popular needs through investment in sectors that are considered “unproductive.” As well, the destructive impact of government-supported mining operations on local water supplies has been a growing source of tension with indigenous communities. Once again, Bolivia is at the epicenter of a struggle over water—this time, over water scarcity—with worldwide implications. Given the combative nature of Bolivia’s social movements, popular and regional conflicts over water shortages, and their impact on Bolivia’s water politics, could be far more explosive than the Cochabamba Water War. This article was originally published in ReVista, Harvard Review of Latin America, Winter 2013, Volume XII No. 2. See Susan Spronk, “Post-Neoliberalism in Latin America? Urban Water Supply Management in Bolivia Under Evo Morales,” unpublished draft prepared for the Latin American Studies Association, May 26, 2012.